Remember way back in May when I asked for cross-country road trip help? Well, on June 8th we got the heck out of rainy Vancouver and headed east. Well, a super quick overnight stop in Seattle to visit with my best friend and another overnight dip into Portland, because it’s been over 2 years since our last PDX trip, and then, finally, we were on the road heading east. As soon as we crossed the Cascade mountains, we were hit with sunshine and a heatwave that didn’t let up until we crossed over the Cascades again. We packed a lot into our 3 week holiday. There was a lot of driving – 11,000 kilometers worth (that’s over 6800 miles, to you Americans). But there was a lot of exploring, tons of iced coffee drinking, a heck of a lot of playing auntie and so much new baby holding (though not enough for my liking). Instead of recapping every single moment, I’ll share the highlights of our trip, many of them food related! And a few observations too. First stop, Salt & Straw in Portland where Cornelius and I shared a cone of almond brittle & salted ganache ice cream. Our fantastic mexican feast at the Red Iguana in Salt Lake City. Pineapple upside pancakes at Snooze in Denver – a no-contest best breakfast of the trip goes to these serious pancakes. I’ll have to try to recreate them soon! The Gothenburg Historical Museum in Gothenburg, NE for having such a charming little museum, complete with an amazing barbed wire collection (these kinds of stumbled up on treasures makes road trips so wonderful). The hoards of fireflies at Knob Knoster state park in MO – I’ve never seen so many fireflies in one place and it helped make for an incredible camping experience. The City Museum in St. Louis, MO – thanks readers for the heads up on this crazy place!! Cincinnati, I had no idea you were such an interesting city (we stumbled into a dead zone of an incredible old neighbourhood going to ruin that neighbours the gentrifying Over-The-Rhine neighbourhood & then discovered a cool, diverse little ‘hood called Northside where we found a nice vegetarian cafe for lunch). And then there was Detroit, which pretty much blew my mind. I loved it and at the same time, felt so sad for a city that felt so empty and abandoned. Yet there was a lot of hope and I could see that from the amazing art that rose out of neighbourhoods: from the Hamtramck Disneyland folk art found in an alleyway to the jaw-dropping Heidelberg Project. It was in contrast to the gorgeous old skyscrapers, like the Guardian Building, found downtown. Detroit, you left me curious. We spent a good 24 hours in Chicago and noticed how much it has changed since we had been there last (9 years ago). Wicker Park got seriously gentrified. Our hotel was amazing and we crammed in so much art and loved exploring the Millenium Park area. Also, if you’re ever in Lincoln Park, make sure to grab some sandwiches and a delicious Arnold Palmer (made with pink lemonade) at the Bourgeois Pig Cafe. As we headed west, I immediately felt at home crossing into Wyoming. What can I say, the west is the best (but I’m biased, of course)! 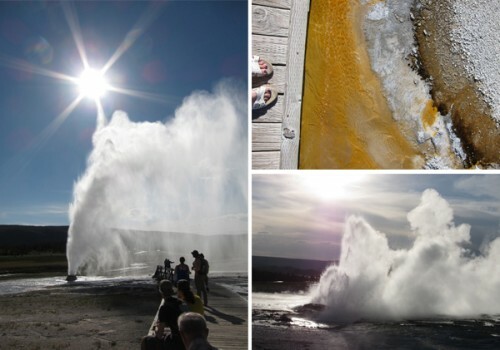 We spent 2 days (not enough time) exploring Yellowstone National Park and in that time we got soaked by a geyser, saw bubbling mud pots, watched a family of buffalo (including baby buffalos) walk by and got blown away by the majesty of the place. the midwest has a lot of red pick up trucks (and a lot of big vehicles in general). East of Bend, OR there aren’t a whole lot of Smart cars. east of the cascades there weren’t many recycling options. And styrofoam was strangely prevalent – I never see styrofoam here in Vancouver. mosquitos like me a lot (which is why I’m so glad Vancouver has very few mosquitos, if any). Scratching mosquito bites was a common theme of this trip. a Southern accent is really, really charming. with all the driving we did, we sure saw a lot of road kill. While looking for a state park to camp in Wisconsin, we almost hit a pheasant that came flying out of the woods and a few miles down the same road, a deer raced out of the same woods. Luckily, our car has great brakes and we didn’t contribute to the road kill count. I’m not a fan of humidity. My frizzy hair & sweaty face agree. Our trip was great and I’m already hoping we can head back to Yellowstone (maybe in the winter?). But after all the driving we did, our car got rammed just as we were almost home. We were in line at the border crossing in Lynden, WA when a car came barrelling out of the dairy parking lot across the street. They hit our back wheel so that it was un-drivable and we had to get towed across the border. We were all a bit shook up and it certainly put a damper on the tail end, but boy, were we ever so glad to get home! Now, let’s get on to this rosemary lemonade which I request you get started on right away. I drank this just before we left for home at Fiamma Pizza in Bellingham. They stole the recipe from Seattle’s Cafe Flora and I’m so thrilled to have the recipe to share with you. It’s found in the Cafe Flora Cookbook along with a few other great looking recipes. 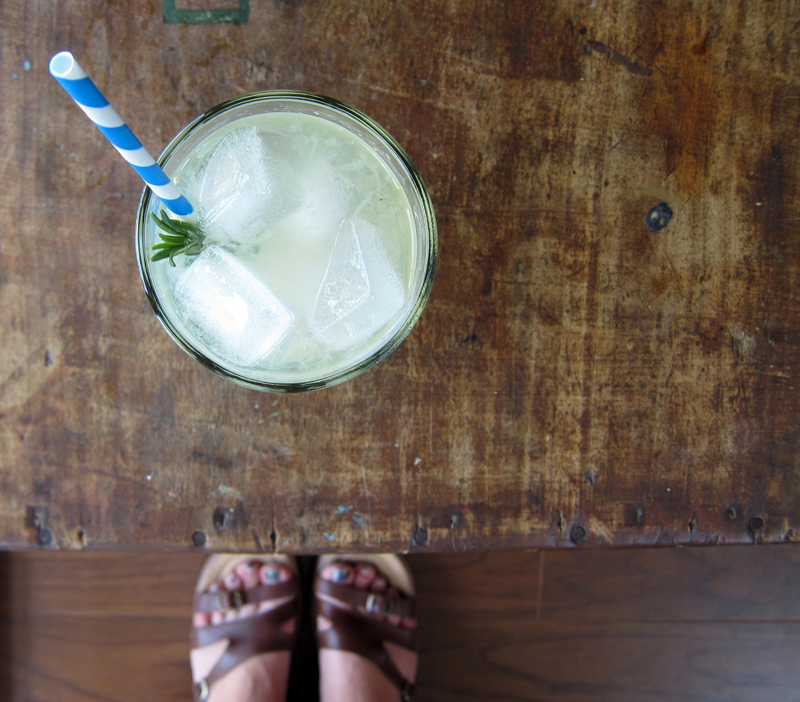 This drink is refreshing and tart and woody from the rosemary and I could easily drink gallons of the stuff on a hot day. And thankfully, a day after we arrived in Vancouver, summer hit with a vengeance. There’s no heatwave here yet, but every day has been oh so lovely. Perfect lemonade sipping weather. elsewhere: I’ve got some catching up to do! Please head over to check out my last few Poppytalk posts. First, you’ll find a delicious and easy couscous & arugula salad loaded with cucumbers and those bitter greens! Looking for a healthy waffle option? Check out these delicious whole grain waffles that are light and crispy! Got a picnic coming up? Try this buttermilk southern style coleslaw! First make some rosemary tea by bringing the 4 cups of water and the rosemary to a boil in a medium saucepan. Let simmer over low heat for 25 minutes. Discard rosemary. Stir in sugar until melted. Cool on countertop and then move mixture into the fridge. 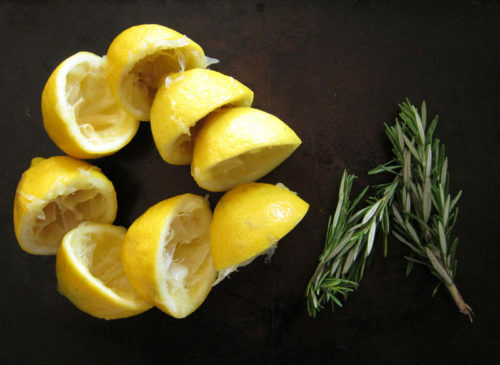 When cold, add in the lemon juice and cold water. Stir and taste, adding more lemon juice if you like more of a pucker. Pour into ice-filled glasses and enjoy. 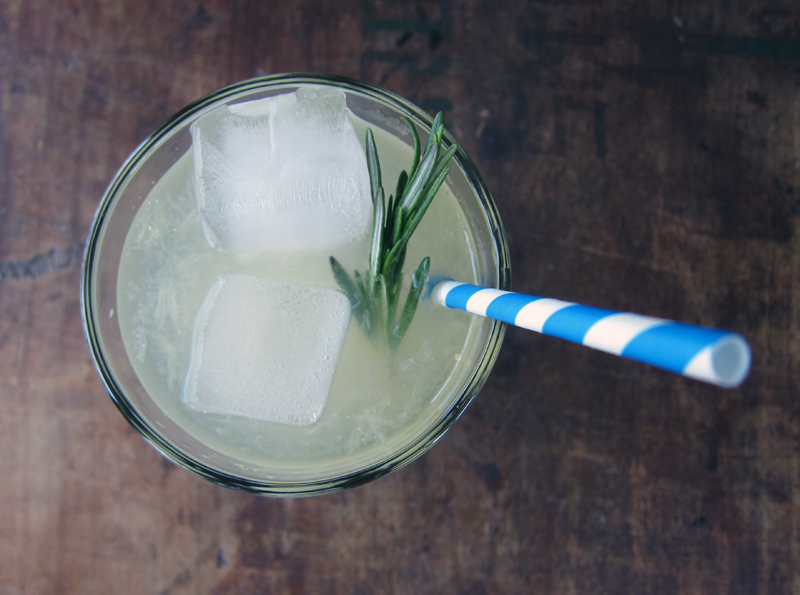 Garnish with sprigs of rosemary, if you wish. Your poor car! I hope that it feels better soon. This sounds like a wonderful road trip. I’ve never seen the west or central part of our enormous country (except for a quick trip to Detroit to see cousins when I was in 6th grade, so that doesn’t really count), but you’ve reminded me of all that I do want to see. Also funny how you’ve been to a million places that I (an American) have not. 🙂 One of these years maybe we’ll get to take a trip like that: Yellowstone, Chicago, and Portland are all on my list of places to see! Quite the trip! Glad to hear that you made it home safely (aside from the poor car) and that you had a good time in my fair city (Chicago). If you drove through Wisconsin, you may have noted even more red pick-ups than usual for the Midwest — a symbol of UW Badgers pride! I’m from Minneapolis and then Madison, pretty green (and liberal) cities, so I too am often shocked by the lack of recycling on road trips! I was wondering how your trip went! It sounds amazing. I’m so jealous you went to the City Museum. We’re already scheming for a longer trip to Chicago, this time with a side trip to St Louis FOR SURE. Can’t believe you got into an accident at the last minute! At least it was at the end, right? Oh no! I’m so glad you guys are okay and that the rest of the trip was amazing. You’ve officially seen more of America than I have! I was following along with you! We have no vacation this year since we bought a house–house-poor, that’s the term. That road trip sounds really fun. I really want to visit Chicago one of these days. I’ve lived in WI my whole life and I’ve only ever driven through it on the way to somewhere else. 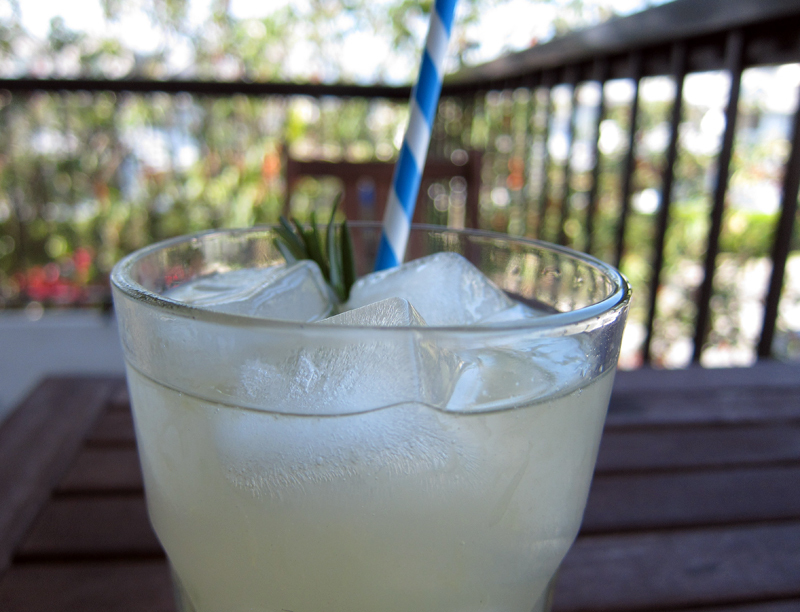 oh, i love the rosemary lemonade at cafe flora. i will have to try this myself. and next time you come through seattle and it’s not a whirlwind visit i would love to meet you! so sorry about your car, but in case you head that way again, the soft serve ice cream at said dairy (Edaleen) is really good, and that usually is the fastest border crossing in these parts. That sounds like such an amazing trip! You’ve seen more of my country than I have. One day I’ll try to hit some of those midwest states…but Portland and Chicago are high up on my NEED TO GO list! Lovely recap! You two did pack a lot into your road trip! So sad about the accident at the end, but glad everyone is ok. It was such a pleasure to meet up with you and your husband :)The rosemary lemonade sounds divine! Welcome back to the west coast! Your trip sounds amazing! We just got back from taking the train across Canada and it was pretty awesome too. We have our eye on the States for our next road trip. 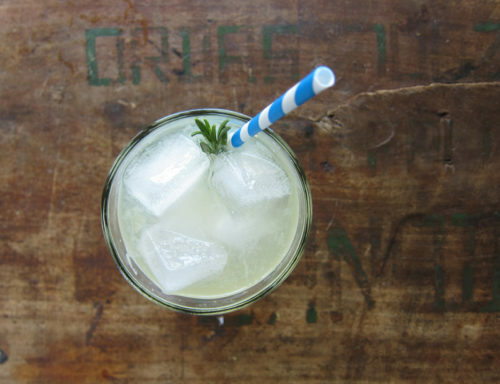 This lemonade looks really good – love the rosemary Idea, we’ll try it out this weekend. 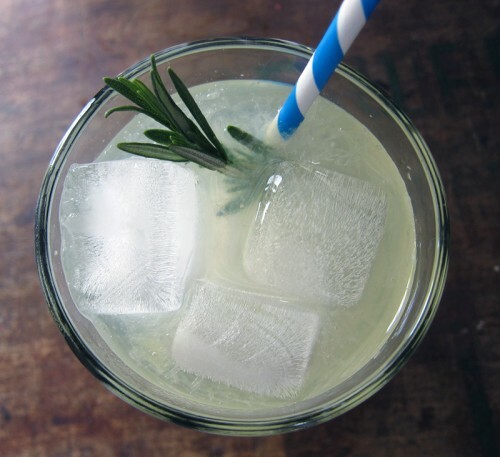 interesting about the eco facts – welcome back – must try this rosemary lemonade! Is the unnamed vegetarian place in Cincinnati called Melt? Love that place. I grew up one neighborhood over from Northside! What a bummer about the accident so close to home! It looks like a wonderful trip, how fun to do, and see, so much! Dang, what a trip! And the Cafe Flora cookbook is one of my favorites! There’s a pate recipe in there that’s complicated, but incredible. Sounds like you had a great trip! Sorry to hear about the vehicle mishap but glad to hear you came out of it alright. 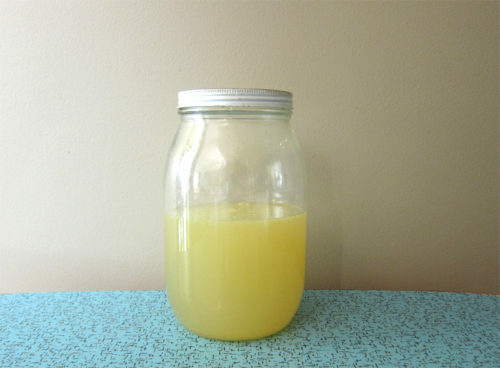 I love drinking lemonade. I made a lavender pink lemonade a month ago but I’m open to other variations with other fragrant herbs. ara jane, yes! I can’t believe we haven’t met yet! Let’s make that happen. Nicole, it was so great to meet you & your husband! And the cookies, the cookies!!!! Elizabeth, it was called Melt! Thanks, I had forgotten. Jenni, the sandals are an old pair of Dansko clog sandals. And not as comfortable as I had hoped. Kate, thanks, I’ll check out the pate recipe! Glad to have found another Vancouver blogger. 🙂 This sounds lovely! I have to say I’m mad that I didn’t know about Salt & Straw before I was in Portland! I recapped my fav eating spots here: http://flutterflutter.ca/2012/06/06/portland-oregon-where-to-eat/ and would have loved to know about that yummy spot! Thanks so much for sharing your hits from the road! (But sorry about the car situation – what a nightmare!) This post made me even more excited, if that’s possible, for me and hubby’s own roadtrip next month from New York to Colorado and back. We’ll be cruising through some of the same towns, so very much appreciate the leads! Sounds like an awesome vacation! I too took in Detroit and the Heidelberg Project was one of my favourite things on my vacation. 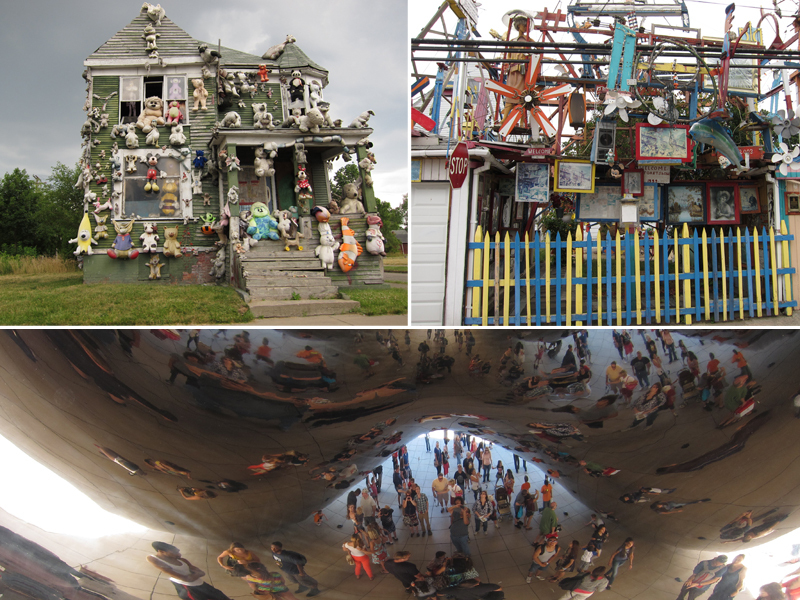 So much creativity and whackiness – especially the polka dotted house! Detroit was a huge eye-opener, and then we got lost on 8 Mile (Damn Mapquest and your incorrect directions!) but eventually safely home to Windsor. Sweet Relief! Speaking of relief, I know I’d love this lemonade on a scorching Prairie day. Rosa, thanks for finding me! Your blog looks awesome and as for Portland, Salt & Straw is the best ice cream I’ve had. Ever. So good. Jennifer, have a great road trip! I’m not sure if you’ll be heading north at all, but I can’t recommend Yellowstone enough. I’m glad you got to check out the H Project, Renee! It certainly is a huge eye opener, isn’t it. Shocking & amazing all in one. SOunds like a great trip! Such adventures. I love the look and sound of this lemonade…will have to try it soon. Thanks, hag! The lemonade is amazing!